There is nothing quite like opening the front door of your home and feeling your whole mood lift. It’s the sure sign of a house that is a true reflection of you and your family, but where do you start in creating a haven that makes you happy? 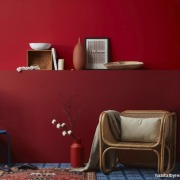 Two uplifting and cheerful reds have been cleverly used together for added dimension in this room, with Resene Poppy on the upper wall and Resene Dynamite on the lower wall.Further layering of red comes with a floor vase painted in Resene Raging Bull, the shelf vase in Resene Moccasin and the exotic earthy toned rug. The floor stencil is painted in a base colour of Resene Wishing Well, also used in the matching side table, with Resene Time After Time. The impact of different colours on our mood is a huge and fascinating area of human psychology, but it can also be a little overwhelming. 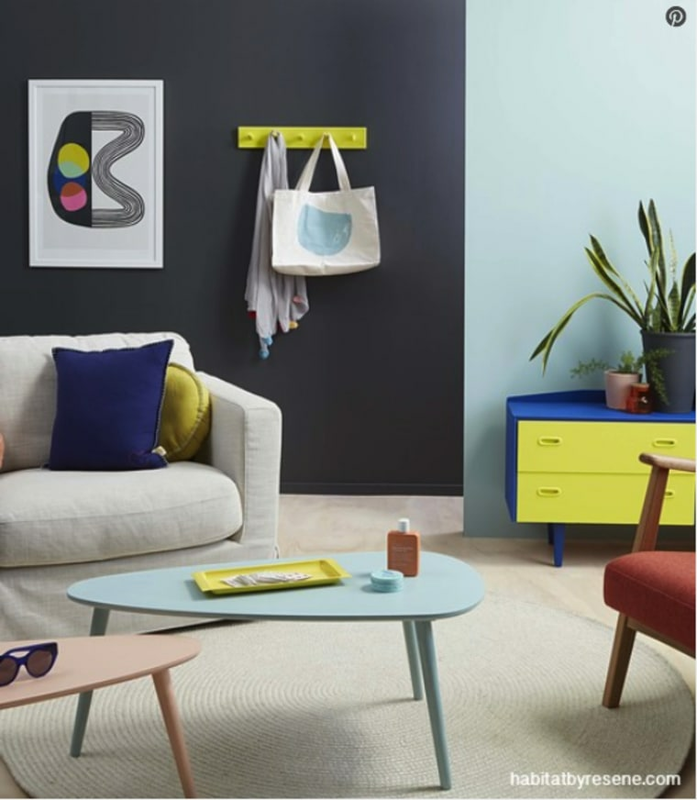 If you rely too heavily on Google to find out the impact of certain colours, you’ll head down an internet rabbit-hole that may make it impossible to make any actual decisions about what colours to paint your interiors. 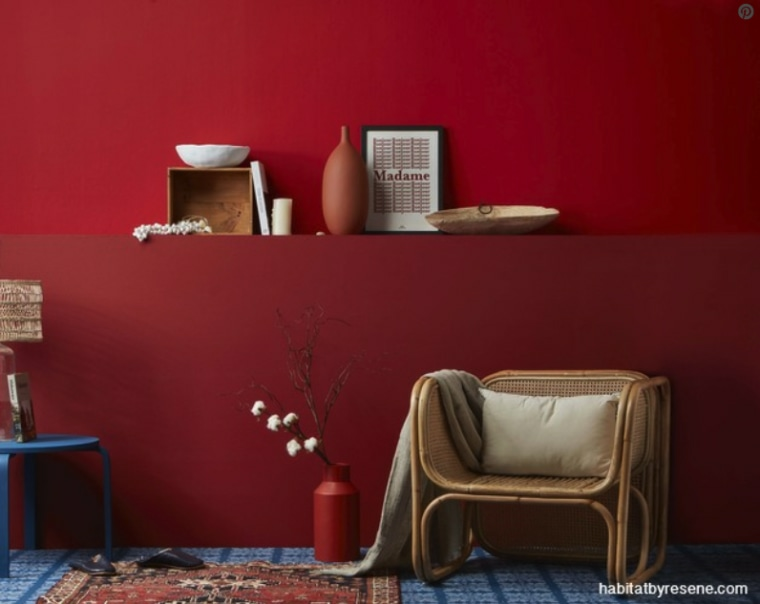 There are some broad guidelines you can use but for every positive colour association - such as red for warmth or blue for serenity - there is also a flipside connotation such as aggression for red or coldness for blue. Our relationship and response to colours is also very personal, based on our own experiences, memories and associations. One person’s sunny saffron is another’s garish gold; where one person may find pastels relaxing and serene, another may find them insipid and bland. The best advice is to trust your instincts and your personal taste. After all, nothing is going to make you happier than seeing a colour combination you have chosen simply because you like it. Start with a list of each room in your home and the feeling you want it to evoke, such as comfort, creativity, individuality, warmth, togetherness, calm. Then create a mood board of Resene paint swatches, and images you respond to, from magazines, personal photos, advertising, art and books. Still stuck? Invest in some sheets of card and a few Resene testpots. Note which colours you like on their own, and how your reaction changes when they’re paired with other shades or in different rooms. From there you can start to curate your own colour palette that suits your emotional landscape. Yellow has to be up there for being a happy colour. At its sunshiny best, it lifts the spirits and as a rich gold, it feels luxe and confident. It’s the colour of optimism, confidence and creativity. Beware of using too much yellow though – it may be best as an accent. Walls painted in yellow will reflect on themselves, making the colour even more intense. Buttery yellows are easier to live with. 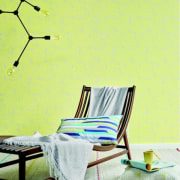 Try Resene Quarter Moonbeam for a pale uplifting yellow, and Resene Chorus Line for an on-trend happy yellow. Bold yellow is popular for front doors to add a cheerful touch to usually neutral home exteriors. Red is an energising colour, known to lift your mood and increase your appetite. For a room that is inviting and sophisticated, try deep reds like the ever-popular Resene Pohutukawa. For a more stimulating feel, use a cheerful red like Resene Poppy. Red is also ideal for front doors to welcome guests in. Pink is at the soothing end of the ‘happy’ spectrum. 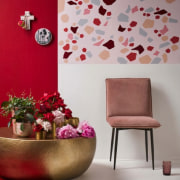 The right shade will make your heart sing, and with today’s love of all types of pink, from peach to blush, coral to lilac, there’s a colour that will make your feel warm and fuzzy. It’s a nurturing colour that will make you feel safe… always a good basis for happiness. Try a contemporary peach pink like Resene Despacito or Resene Shabby Chic. As well as a colour scheme that sings to you, there are other things you can do to create a happy haven. One of the simplest is to make sure your space reflects you and your family. Decorate with items that mean something to you, whether it’s art, photographs, family treasures, foraged finds or simply something that you love the shape, colour or texture of. Walking into a home filled with your happy associations is an instant mood-lifter. The flipside to a curated collection of things that matter is to declutter the things that don’t. It’s a simple stress-reliever. Then try to make sure there is a place to store everything, and it gets put back in that place. Knowing where to find things when you need them is an instant way to improve your state of mind. Creative use of artificial lighting will also lift the look of a room – much like turning your face to the morning sun does when you’re outside. Create retreats within a larger room, with a good chair, bookshelf and a lamp. Think about adding dimmers to downlights so you can change the lighting to suit your mood or the room’s use. And always make the most of natural light where you can. Use curtains that pull right back. It keeps your indoors connected with the outdoors, and floods rooms with natural light - all proven mood lifters. As well as how a room looks, think about how it impacts your other senses. Play with textures like silk, velvet or even rattan in your furnishings. Think about the finishes of walls and floors with raw wood and whitewashes or wallpapers. Find a scented candle that helps you feel relaxed, or energised and have music readily available. Including lots of plants inside is another easy, effective way to engage the senses and inspire a calm happy space. Try leafy green plants in otherwise neutral rooms painted in warm creamy shades, to add depth and texture – and create the feel of a tropical escape. Also think about creating a screen-free room in your home where the whole family can retreat together. Fill it with board games, books, music and comfy chairs with cosy throws. Dress your dining table with generous bowls full of fruit, or vases of flowers. There are both positive and negative psychological attributes attached to most colours. Here is a brief guide to some of them, but remember everybody responds differently. Different shades, intensity, light levels and even cultural history, will all impact how colours make you feel. So trust your instincts! There’s no hard and fast rules about what will make you feel good. Red: Stimulating and friendly or aggressive and demanding. Yellow: Optimistic and confident or irrational and anxious. Pink: Soothing and nurturing or sickly and claustrophobic. Blue: Serene and secure or cold and distant. Green: Balanced and harmonious or boring and stagnation. Violet: Inspiring and luxurious or overwhelming and decadent. Orange: Warm and passionate or frustrated and frivolous. Black: Sophisticated and substantial or oppressive and dark. White: Pure and simple or cold and sterile. 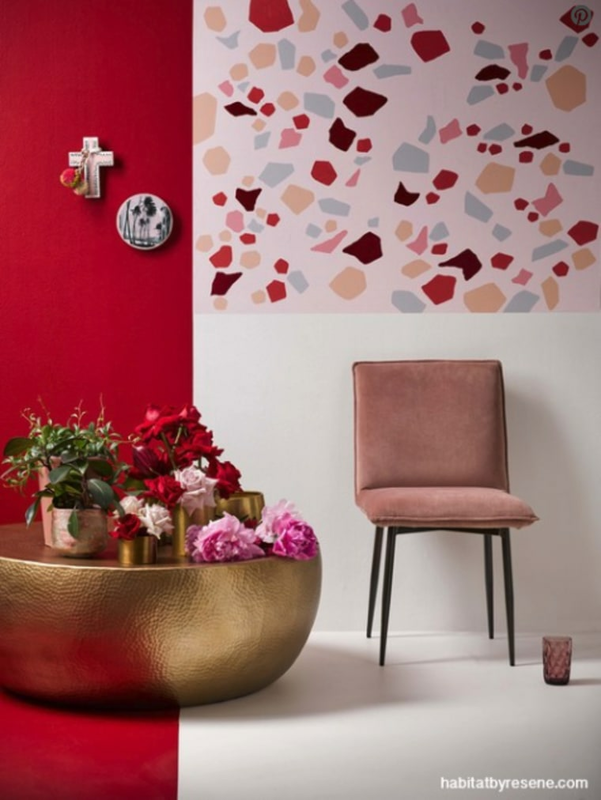 A bright modern happy space with a fun terrazzo-style wall pattern painted in Resene Burnt Crimson (burgundy), Resene Negroni (peach), Resene Glamour Puss (pink) and Resene Longitude (blue/grey). The side wall is Resene Red Berry, the upper back wall is Resene Vanilla Ice and the lower wall is Resene Rice Cake. Nostalgic styles make us smile and warm our hearts. 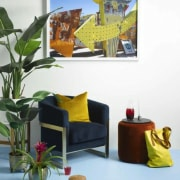 This bach interior is a happy mish-mash of colours with Resene Nocturnal on the back wall, Resene Ashanti on the side wall and retro coffee table. The other table is Resene Sakura, the hook rack and drawers are Resene Gorse and the sideboard top and sides are Resene Space Cadet. 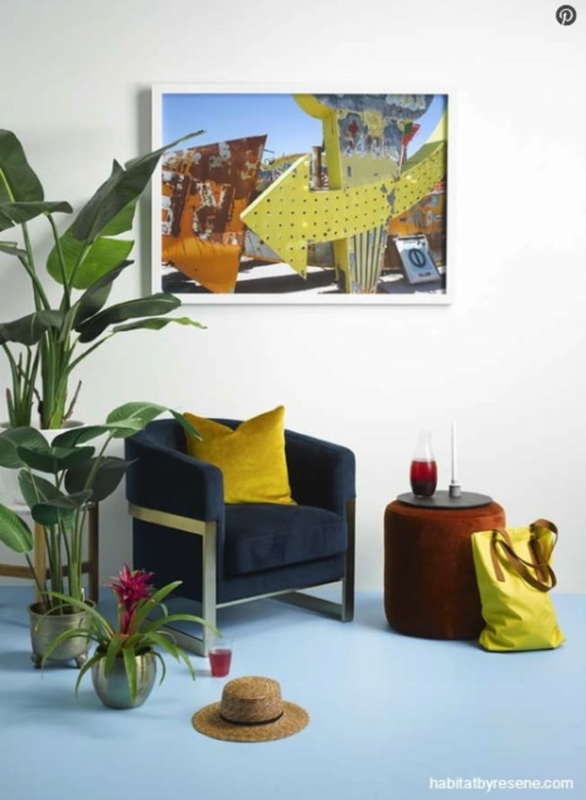 Summery colours and house plants make us feel good. The walls in this room are painted in Resene Black White and the floor is in Resene Jordy Blue. Yellow is the colour of sunshine and mental invigoration. The lower wall in this office is painted in Resene Wild Thing while the top is Resene Black White. The noticeboard is in Resene Bright Spark while the side wall is turned into an over-size noticeboard with a grid of squares in Resene Blackboard Paint. The filing cabinet is also finished in Resene Blackboard Paint. A deck chair inside? Why not? Bring the relaxed vibe of summer inside. 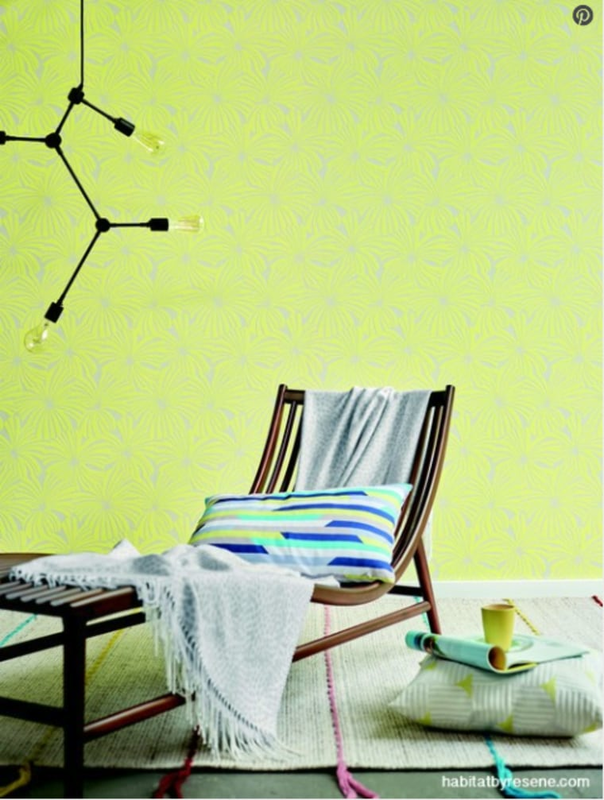 The wall is in Resene Wallpaper Collection design 327593, from Resene ColorShops. 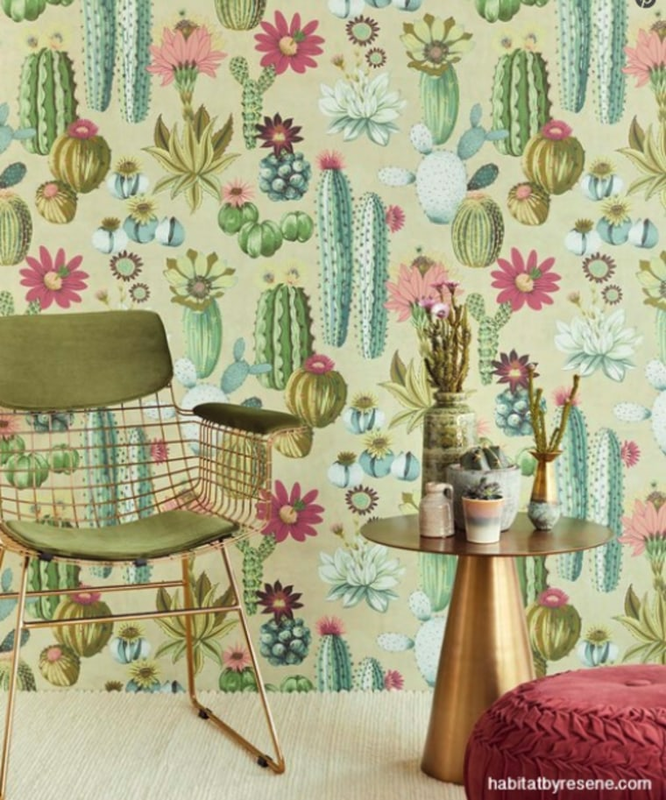 A fun wallpaper pattern will make you smile. 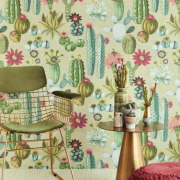 This is Resene Wallpaper Collection design 384605, from Resene ColorShops.